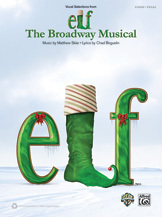 Based on the immensely popular motion picture, Elf: The Broadway Musical first delighted New York audiences during the 2010 holiday season, and is now a perennial favorite returning to Broadway and heading to regional theatres everywhere. Written by Chad Beguelin (lyrics) and Matthew Sklar (music), its score is critically praised as polished, swinging, melodic, and hummable. This collectible songbook, which includes photos from the original Broadway production, allows vocalists and pianists to apply their talent to the entertaining songs of this hilarious and endearing holiday tale. Titles: * Christmastown * World's Greatest Dad * In the Way * Sparlkejollytwinklejingley * I'll Believe in You * Just Like Him * A Christmas Song * Nobody Cares About Santa * Never Fall in Love (With an Elf) * There Is a Santa Claus * The Story of Buddy the Elf.